So, I finally saw Pacific Rim a couple weekends ago. I opted to give this movie a pass when it came out in July, believing it to be just another dumb summer blockbuster involving robots, a la Michael Bay’s Transformers franchise. As a reader at heart, I tend not to like most movies I watch, especially those that come out in the summer. If I watch a summer flick at all, it’s usually on video, and for the benefit of some mindless entertainment after a tough week at work. But Pacific Rim surprisingly gave me a lot to think about, particularly with regards to its characters. One of the blogs I follow, associate literary agent Maria Vicente’s I Believe in Story, features a category of posts entitled “Character Study”. It’s out of a case of imitation being the highest form of flattery that I come to adopt the same feature into my own blog. That and as a follow-up example from my recent post about suspense, in which I recommend casting unconventional characters because they’re unpredictable (and thus suspenseful). 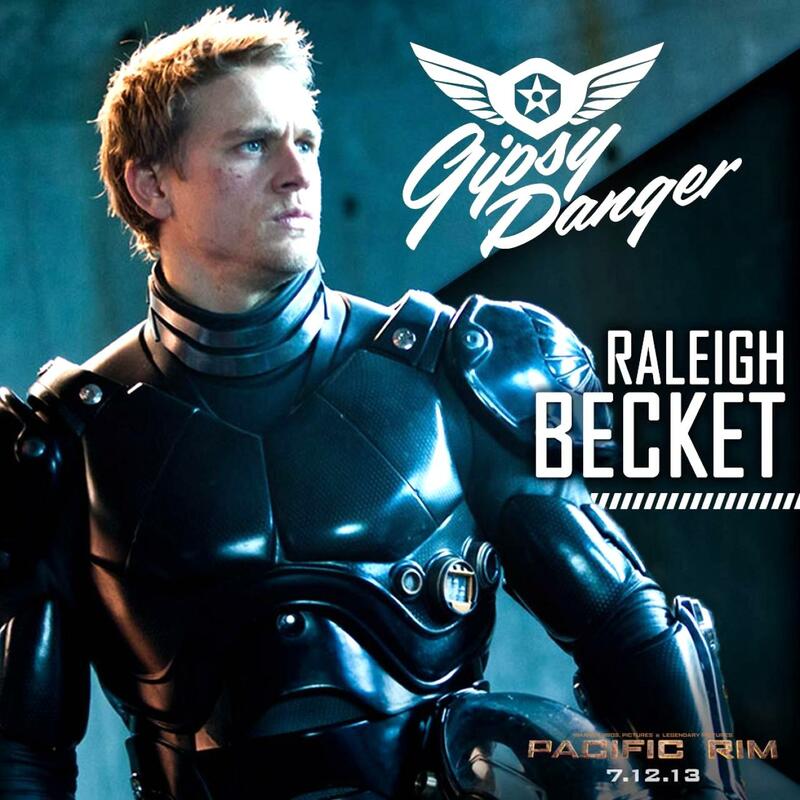 Pacific Rim’s Raleigh Becket is one of the most unconventional characters I’ve come across in a long time in the sci-fi military adventure genre. Raleigh begins the movie as a hotshot pilot of a jaeger, a giant, robotic fighting machine designed as a melee weapon against the alien kaiju, which emerged on Earth from an inter-dimensional breach at the bottom of the Pacific Ocean. All jaegers are operated by two pilots via Drifting, a system that joins their minds as one so their combined brain power can withstand the neural load associated with controlling the robot with both body and mind. Raleigh pilots his jaeger (Gipsy Danger) with his older brother, and as the movie opens, is shown to be the more cocky and maverick of the two as the pair get set to take on the largest kaiju to date. Within the first 10 minutes of the movie, Raleigh’s brother is killed in the attack, Raleigh is injured, and his jaeger is badly damaged. The scene then skips to five years later where Raleigh is longer a pilot but instead performing menial labour for food rations until his old commander re-recruits him to assist in a last-ditch long-shot mission to try to end the kaiju threat for good. Dark and tortured because he contributed to his brother’s death, and unwilling to be part of the team because clearly no one else has ever experienced a loss of their own. But Pacific Rim does it refreshingly different. Raleigh is definitely still mourning his brother’s death, but he’s also obedient, cooperative, and, frankly, kind. Upon meeting Mako Mori, the rookie who eventually becomes his new co-pilot, he demonstrates congenial curiosity about her life, and advocates for her to be given a chance to fight when the commander expresses reluctance. He advocates for her again after she commits a serious error, not because her grounding results in him facing the same fate, but rather because he relates to her motivation and feels the commander is holding her back from fulfilling her personal quest due to the fatherly affection he has for her. He and Mako work well together throughout the entire movie, not once succumbing to disputes or egoism related to his greater experience. Raleigh only gets into one brawl with a self-important top gun, partly in defence of Mako’s honour and partly in defence of his own, but this is only after he’s already taken both the stink-eye and lip from this other pilot without reaction. And even after winning at fisticuffs, rather than strut around like the alpha male he appears to be in the movie poster above, Raleigh is quick to forgive and forget for the good of the mission. Neither does he at any point put the romantic moves on Mako, theirs being a much deeper relationship built on mutual loss, emotional support, and hope for a better future. Much of Raleigh’s character is a reflection of the movie’s larger, theme of trust and teamwork, which is also atypical for this genre. In melding of two pilots’ minds to operate the jaeger, a sharing of thoughts, feelings, and memories occurs, thereby necessitating strong trust and openness between each pair. As well, every goal that is accomplished in the movie comes as a result of multiple layers of collaboration: pairs of pilots; two rival scientist who eventually come to an understanding; jaegers from a number of different country and built following international reconciliation of hostilities in face of a larger, global threat. I actually really enjoyed this movie. To be sure, it’s not perfect: there were a few WTF moments (e.g. deciding to build a wall to deter the kaiju after having already spent all the world’s resources building the jaegers) and a few elements I wish had been explored more (e.g. how Drifting effects its participants over the long term, and how fighting with hanbō staves alludes to two people’s compatibility for Drifting). Plus, it’s still, at its core, a movie about giant robots fighting giant monsters in the middle of the Pacific Ocean. But Pacific Rim contained a lot of interesting characterization choices and story themes that, for me, elevated it above the typical mindless fare of summer movies, and, even more surprisingly, has left me hoping for a sequel. This entry was posted in Character Study and tagged Characters, Movies, Sci-fi, Suspense, Theme, Writing, Writing inspiration. Bookmark the permalink. As a long-time fan of Japanese Sci-fi, I can tell you that Pacific Rim was a love letter to that genre. Raleigh is very Japanese in his demeanor, and the platonic nature of his friendship with Mako was similar to what would happen in one of those films. That’s one of the things I like about Japanese art… how it has evolved to be so very different from western art. Sometimes it annoys me when people criticize Japanese films for being “unrealistic.” Realism is not and never has been the goal or the aesthetic there. Some folks have a hard time wrapping their heads around the idea that their way is not the only way. Good post. You are goods at reading between the lines and digging below the surface. Eric, what interesting insight you’ve offered on the matter! I’ve never watched or read Japanese sci-fi before, but now I’m starting to think I should be. Any recommendations? I love that you say Raleigh’s demeanor was very Japanese, for I love the idea of artists borrowing story elements from different cultures. It’s certainly a fertile ground to draw from. And as for realism, I’m fully able to suspend my disbelief so long as the story follows it’s own internal logic. Imagination is healthy; those who criticize should give it a try. Pacific Rim really took me by surprise. It started off as a typical Western sci-fi movie and then quite abruptly, it wasn’t. I was half-asleep through the introduction of the two brothers, through their joking with the Ops guy about his date the night before, even through Raleigh’s re-encounter with his command. Yawn – been there, done that. But the movie changed notably when Raleigh first meets Mako. Suddenly, I was awake and invested in what was happening, which is the whole point of telling a story. Am I setting a new record for tardy response? I suggest the Gamera trilogy (1995-1999). Don’t confuse it with the hokey kids’ movies from the 60s seen on Mystery Science Theater 3000. The Heisei-era (Japanese movies filmed in the 1980s and 90s) Gamera films are the best of their genre. Many of the key characters are women, and there’s nary a romantic subplot in sight. The third film over-relies on b-grade CG effects, but otherwise they are pretty good. “Gamera: Guardian of the Universe,” “Attack of Legion,” and “Revenge of Iris” are the titles.